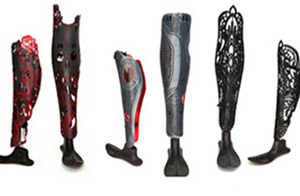 UNYQ Armor covers are 3D printed leg covers that are custom made to fit over lower limb prostheses. They protect the prosthesis whilst filling out pants and holding up socks. They attach magnetically providing quick access to prosthetic componentry. They are lightweight and come in many different design choices.